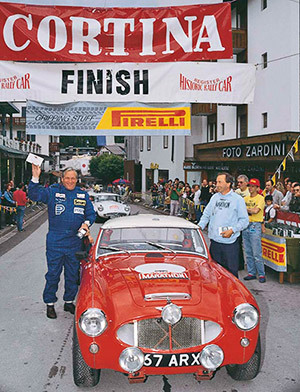 Twenty five years ago, in June 1988, Philip Young's Classic Rally Association, later to become the Endurance Rally Association, began the whole era of international historic rallying. On Sunday June 19th 1988, The Pirelli Classic Marathon, the first ever international rally for historic-cars was flagged off from a starting-grid lined up on Tower Bridge. London's iconic landmark was specially closed for the occasion and that first event drove a seven-day route through the Alps and the Dolomites to Cortina in Italy and back to London to finish in Pall Mall at the RAC Club. The 1st Classic Marathon was featured in an hour-long documentary on BBC2. Subsequent Classic Marathons, with Stirling Moss adding to his Alpine Cups, Paddy Hopkirk winning again in a Mini Cooper, and Timo Makinen back in a Big Healey with Roger Clark driving a Cortina to Cortina were also televised, and seen in over 80 countries worldwide. Rallying for classic cars is now a world-wide scene that was started 25 years ago by Philip Young and his fledgling CRA team. Some of the original organising team are still here, and still working at fresh initiatives and improvements with an un-equalled track record of over 60 major international historic car rallies behind them.